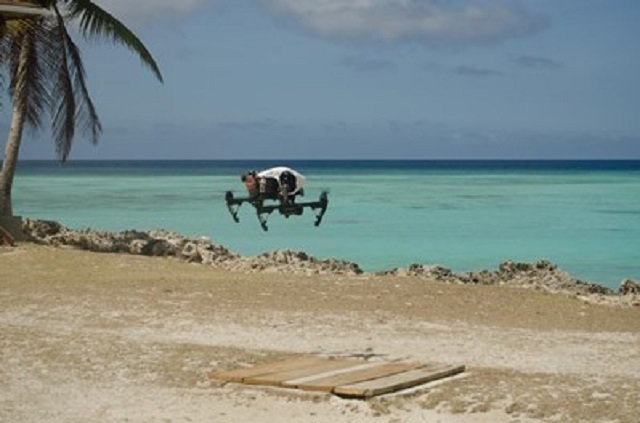 (Seychelles News Agency) - A new survey using drones will enable the Seychelles Islands Foundation (SIF) to gather data on the distribution and population of dugongs in the remote Aldabra Atoll. The Atoll which is managed by the SIF is the last remaining place where the manatee-like species can be seen in the island nation. Jake Letori, who is a volunteer in the research team at the foundation, said that drones will facilitate the capture of spatial data. Letori said this method will provide the foundation with information about the dugong distribution, their exact locations and movements within the lagoon and surrounding reef habitats. “Imagery acquired from surveys could tell us about dugong health and interactions with other marine organisms, especially predators,” said Letori. The dugong -- a medium-sized marine mammal closely related to the manatee -- is one of four living species of the order Sirenia. It is the only living representative of the once-diverse family Dugongidae and is largely dependent on sea grass communities for subsistence. Letori said that this species is likely to survive on Aldabra because they are highly protected from coastal activities. “In other dugong monitoring studies, analysis of photos or videos using software has been used to record metrics such as body length and weight, assessing dugong health while also providing a record of individual dugongs through identification of natural markings,” explained Letori. 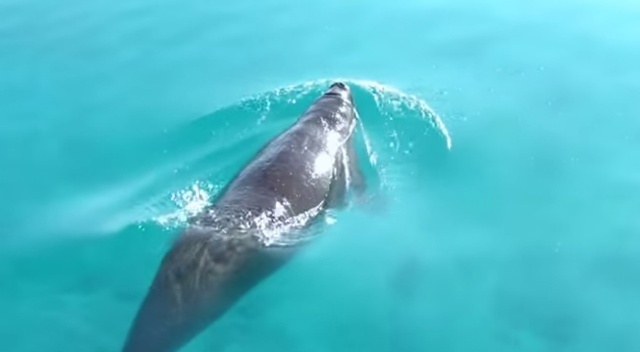 Letori said marine mammals like dugongs are routinely monitored from the sky due to their highly mobile and extensive ranges. “This was previously done with traditional aircraft such as planes and helicopters, but as we progress through the digital age of the 21st century, the miniaturisation of technology, remotely piloted aircraft provides an alternative tool for persons in the field wanting to monitor wildlife,” Letori said. The remote and isolated location of Aldabra, one of Seychelles' UNESCO World Heritage Sites, makes the monitoring of mobile animals very complex where logistics are concerned. “Drone surveys can also be logistically more practical, with low operational costs. There is no need for fuel. Thus reduce transportation and chartering fees,” explained Letori. Dugongs are classified as vulnerable by the International Union for Conservation of Nature (IUCN) red list. Aldabra’s population status is unknown, although it is estimated to be somewhere around 25 individuals. “There have been sightings of groups of up to four individuals, some with juveniles and calves, suggesting that Aldabra may be used as a breeding and nursery ground. The dugongs could be resident or migratory as they are known to travel large distances - up to 600 km. Four individual dugongs have been observed in the lagoon over the past 4 months on Aldabra,” said Letori. Already the Seychelles Civil Aviation Authority has presented the first draft of proposed regulations on the flying of remote pilot aircraft, giving operators the chance to provide feedback. The proposed regulations are in accordance with the International Civil Aviation Organisation that obliges states to protect civil aircraft through regulatory enforcement action from drone activity at aerodromes. The regulations make provisions to safe-guard the property and privacy of the general public. Apart from monitoring species, drones are commonly used locally in photography and cinematography to take an aerial view of Seychelles - a group of 115 islands in the western Indian Ocean. Recently a comedy series, titled ‘High and Dry’, which unfolds with passengers surviving a plane crash on a deserted tropical island, was filmed using drones.